Built for the kill,they say when a living organism-small or big is capable of making a quick and ferocious kill.Something similar is believed about the rather famous fishes of The Amazon-The piranha. Piranhas are South American species of fish found in the tropical river systems in the forests(especially Amazon) of South America.They are often mistaken as hunter fishes, that wait for people to step into water and then they attack in groups and kill.But that is not true.Piranhas are more of a scavenging type rather than a hunt and kill type.Better yet, some species of Piranhas eat plant, fallen fruits and nuts,etc.,Scientists have discovered more than 30 species of piranhas that exist.They do hunt and kill but only on the other smaller fishes. Some types of piranhas are carnivorous but they have a feeding frenzy over a injured animal or dead corpse that might have been swept by the river.This explains why they have sharp teeth.Some species of piranhas have teeth so sharp that when the tribal people catch the fish, they use the piranha's teeth for cutting purposes!. Piranhas are mostly very agile, this is due to the fact that their body is not only streamlined like other fishes, but also it is flattened and are in oval shapes.Their size may vary from 10 to 24 inches in length.They have sharp sets of teeth, that when closed form a kind of closed mesh.They have a very powerful jaw that supports these wedge shaped teeth.Baking up the powerful teeth is a powerful jaw with muscles that enable it to open and close very rapidly. There are species of piranhas that are very aggressive and non-aggressive ones too.Researchers have studied the behavior of these fishes over the years and found that they had a varied diet, that ranged form fruits, seeds,small insects, worms and other small fishes.There has not been a clear reason defined for the sharp teeth of Piranhas.Some suggest it is for the tearing of flesh while scavenging, some suggest it is for cracking open hard nuts and seeds and feeding on smaller fish. In both context, the feeding habit is talked about.This is where the feeding habits of piranhas are peculiar.It is believed that piranhas do not hunt,kill and eat the smaller fishes.Obviously they hunt because they want food but researchers have found after careful observation that piranhas tend to snip off the fins and tails of other fishes for food and leave the victim alive.This allows the victim to survive and re-grow the lost parts like fins.And so piranhas can ensure that they have a constant supply of food rather than wiping out entire populations of smaller fishes. 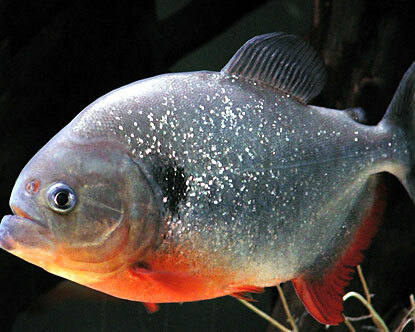 Some species such as the red-bellied piranha,are more carnivorous.Sometimes they scavenge for meat.Yet sometimes,they tend to eat small fish and occasionally frogs, lizards, snakes, and even their own kind.It is said that they sometimes may take bites of flesh from larger fishes also.Some piranhas may hunt in schools. Feeding frenzies by schools of red-bellied piranha are possible over a carcass or a nearly dead animal. Such behavior is more likely in the dry season when water levels are low and food is scarce. As believed,Violent attacks on active large animals or people are extremely unlikely.Piranhas usually spawn in the rainy season when large areas may be flooded, providing food for offspring. Species such as the red-bellied piranha become more territorial and defend a spot chosen as a nest, usually rocks or vegetation. The male guards the nest where the female lays thousands of eggs, fertilized by the male. The eggs hatch in about 10 days depending on the water temperature, and parents may continue to protect their brood for a time.It is at this time that they get more aggressive.Humans or animals may be attacked by piranhas in this season especially if a breeding male piranha is defending territory or defending the breeding grounds. Also piranhas,though might be considered ferocious, local people near the amazon river prefer the meat of piranha as a delicacy.It's like a sport for local tribes to hunt down schools of piranhas since they are dangerous and hard to catch.Let me hope that a few myths about piranha are cleared!. I'm a jovial guy, always in thirst of knowledge and humor!